Tickets and preferred seating for ten to the Fashion Show performance of your choice with your name on table signage. $40 in donation drawing tickets (two sheets). Your name in the Flair Online (monthly, circulation 2,000+). Suggested Luncheon Attire: Dressy Casual. Women should wear dresses or elegant pant suits. Men should wear khakis or slacks, and dress shirts. Suggested Gala Dinner Attire: Cocktail or Party Looks. Women should wear cocktail dresses, long gowns preferably, or elegant suits. Men should wear suits, slacks and a sport coats, or even tuxedos! Bring your finest style and your best smile! We also recommend that you bring cash, checks, or credit cards to bid on silent and live auction items, buy donation drawing tickets, buy casino chips, and buy drinks at our cash bar. Also, don’t forget to bring some extra address labels to easily fill out donation drawing tickets! Parking is available at the Fairmont at a daily rate of $26. Alternatively, there are a number of nearby lots and garages. You can click here for details on nearby city garages:http://parksj.org/parking-map/. It is highly recommended that you carpool. The Fashion Show will be held in the Imperial Ballroom. Live music and silent auction will take place during the reception in the Market Street Foyer (just outside the Imperial Ballroom). Look for the beautiful women carrying balloons and buy one or more sheets of our donation drawing tickets ($20/sheet) for a chance to win one of our amazing packages, valued at up to $2,500!! Enjoy a shopping spree, spa day, or night out for yourself or with your friends! 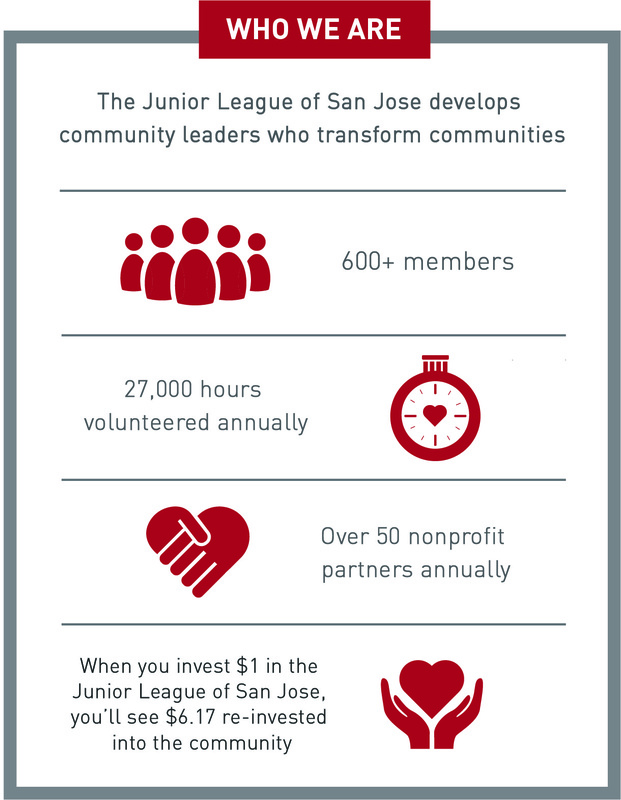 We have you covered with a generous $1000 donation made by the Junior League of San Jose’s Management Team. David Yurman has something delightfully mysterious in store for you! Known for its intricate cable designs and luminous jewels, this piece is sure to make you sparkle! Generously donated by David Yurman Valley Fair. All wine lovers will enjoy a new wine refrigerator stocked with bottles of California’s finest! From Santa Cruz to Napa, these wines will leave your taste buds longing for more! Generously donated by JLSJ Sustainers. Imagine 12 months and 12 different dining experiences! Silicon Valley is home to many delectable restaurants just waiting for you to sample! Enjoy a different dining experience every month! Generously donated by local restaurants. Don’t miss out on your chance to bid even if you can’t be there! Hopefully you will have already received our Silent Auction Guide!! If you cannot attend the event or are modeling, you can submit a proxy bid and our auction team will make sure your bid is recorded! We have hundreds of items ranging from weekends away, to sporting events, to photography packages, to spa treatments, and much more!! We are accepting proxy bids for both LIVE and SILENT auction items! Simply visit www.jlsjauction.com starting March 10th to view the auctions items and make your bid!